This was my first marathon of the year and my 3rd marathon overall since I started joining official races in 2009. 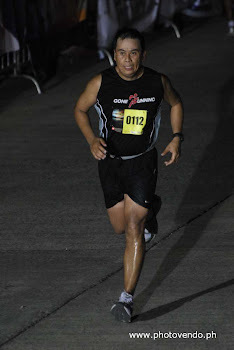 Condura Run was my first official race and ran 10k. I did the 21k last year and finally did a full marathon this year. From hereon, I will be supporting this event by running a full marathon every year. 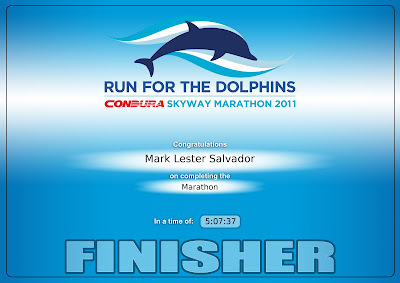 This was a good race for me and so far the best of my 3 marathons. Though QCIM was were I logged my personal best of 5:05:15, I consider this as my best marathon since I did not hit my collapse point somewhere between 28km - 32km. I was not geared to do a PR on this race since I was training for the BDM 102 in March. This marathon was part of the back to back long runs that was scheduled on that week. It was a good feeling to know that the long runs have paid off. Patience brought me to improve my performance from my last marathon. Though I did not set a new PR on this one, I can say overall, this was more rewarding. I was feeling strong in the last 10k, no sign of fatigue, my breathing was perfect, and my form was good. However, I did not attempt to pick up the pace as we kept focused on the plan. I finished in 5:07:37. This helped in building up my confidence and I know that I can still improve if I just continue my training and focus on my objective. I am positive that before the year ends I will meet my marathon target of 4:30. Aside from the fact that this run was considered as a training run, it was also more of a support run to Cherry Jardiniano in finishing her first marathon. She has been training since last year and has been joining our weekend long runs. We knew that she was ready and was surprised to see her performance in the Condura Run. Jay and I were running alongside her throughout the course. She was going strong and was actually picking up speed on uphills in the skyway. Somewhere in the 35th km, she suddenly stopped and said "ayoko na" (I quit). She was starting to feel the fatigue, obviously we are not allowing her to quit, we advised her to continue walking instead so that she can recover. Then suddenly she started to run again and was determined to finish it once and for all. It was a great finish for Cherry and a good time at that for her first marathon. Congratulations Cherry, job well done! This was another example of meeting one's goal by having a clear objective and believing that anything is possible if you put your mind and heart to it. Though preparation and training is a key element, it also requires patience and commitment to successfully achieve your goal.